A metaphor for richness and fertility, ÔPIA® represents the union of two personified bodies evoking the Earth and the Sky. The intertwining of these two complementary elements symbolises the life cycle: the wine takes its roots and draws strength from the soil of the nourishing Earth and its branches rise up towards the Sky thereby representing the union of these two elements. 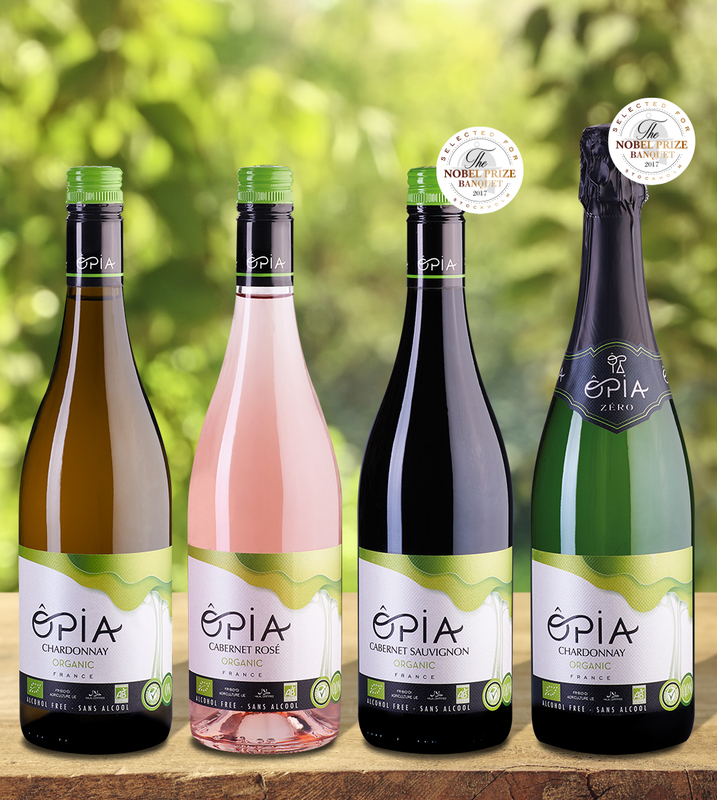 ÔPIA® is a truly innovative product and the first range of alcohol-free, unfermented drink made using organic grapes in order to offer a unique tasting experience that combines elegance and genuine ‘Made in France’ experience. ÔPIA® is aged in contact with French oak and offers a wide variety of aromas as well as a distinctive style that reflects the grape varieties used to produce it such as Cabernet Sauvignon and Chardonnay. This alcohol-free, preservative-free and sulfite-free range of drink provides all the health and taste benefits of the grape thanks to its innovative production process using grape musts. The ÔPIA® range is open to everyone and is aimed at consumers in both France and abroad. Advocating tolerance and the utmost respect for all different cultures, the range offers halal certified, vegan friendly wine based drinks with a 0.0% alcohol content. In order to retain all the health benefits of the grape, the polyphenols and other health giving components are extracted from the pips at low temperatures in order to preserve their antioxydant and regenerative properties. The ÔPIA® range contains between 21 and 29 calories a glass making it 3 times less calorific than a wine which contains 70 Kcal per glass (100ml). ÔPIA® is an innovative range of drinks as well as a solution to today’s cultural issues. It is the very first range of organic, alcoholic-free drinks made using environmentally friendly practices that reflect a deep awareness for societal responsibility. It is produced with the utmost respect for the soils, nature and biodiversity as well as the men and women involves in its production, the local economy and the world’s consumers in order to provide a high quality alternative for those who cannot or chose not to drink alcohol. With its sleek design, elegant bottle shape and colours that reflect nature’s chromatic palette, the ÔPIA® range is the epitome of simplicity and reveals a natural beauty that reflects the true essence of French elegance. Born from a symbiosis between the Earth and the Sky, ÔPIA® reminds us of what is really important in life. The image of the tree advocates nature and simplicity and suggests a source of infinite fertility that constantly regenerates itself throughout the seasons.